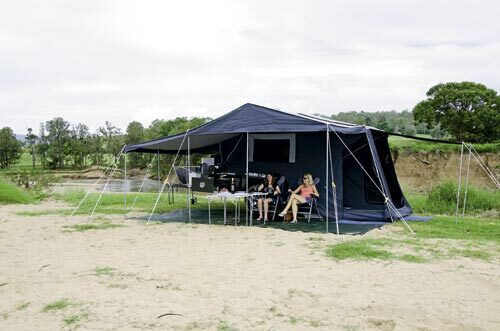 As if testing the latest innovative camper trailers wasn’t a great enough perk, every now and again I get to experience new, interesting camping venues in my role as Queensland correspondent for Camper Trailer Australia magazine. 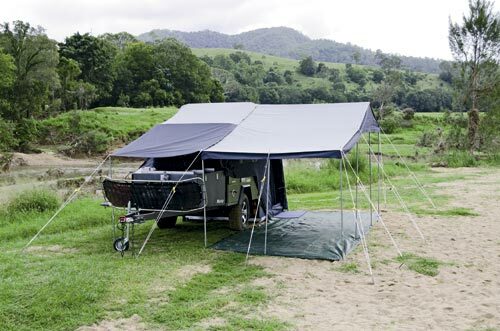 My latest venture took me two hours’ north of Brisbane to Kenilworth Homestead and her rambling, borderless campsites on the Mary River, which was begging for a line. I had read good things about the homestead but was still pleasantly surprised and will return for a proper holiday with the family in due course. 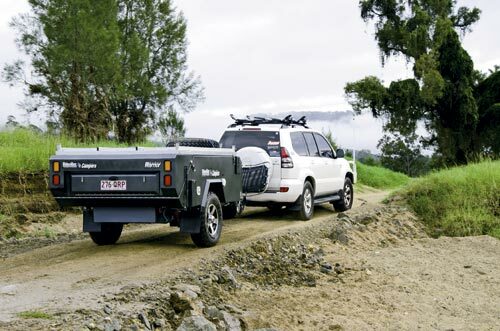 The camper trailer up for test was the Rhinomax Outback Warrior RX which, like the rest of Rhinomax models, is manufactured on the Sunshine Coast in Queensland. The blokes behind Rhinomax, Steve Punton and Andy Dean, are a delight to deal with although it’s pity they support England in the rugby and cricket. Go South Afri…I mean, Australia (now I, ahem, live here). 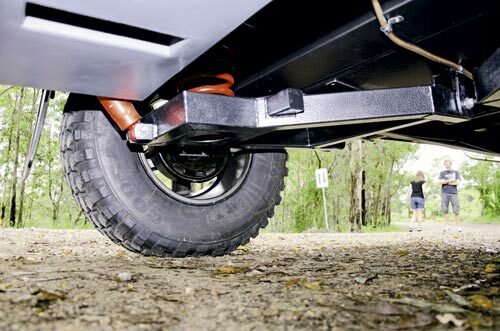 So what sets Rhinomax camper trailers apart? Firstly, the company builds them from the ground up so they’re pretty much 100 per cent Australian. Secondly, Andy has worked for Rolls-Royce, so quality workmanship and design is his forte. 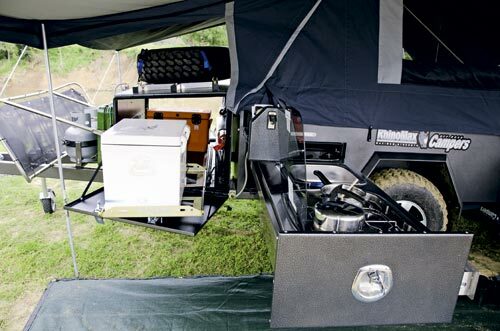 Built to suit outback terrain, the Warrior RX is also a hot looker on road, sporting a hardfloor base, large sleeping quarters, a few interesting storage compartments, a nice size awning above the kitchen, gas cooker and hot water system, large tool/storage box up front and few smart modern appliances to finish it off. Getting to Kenilworth on the day included a relatively painless tow through windy roads in the Black Mountains and down the other side on a tight dirt track. Having large 16in offroad rims and tyres with electric brakes, Al-ko 3500kg offroad hitch, adjustable offroad independent suspension with Pedders heavy duty shocks, coil springs, Nolathane bushes, 50mm sq solid axles and parallel bearings, the Warrior RX towed effortlessly on and offroad. 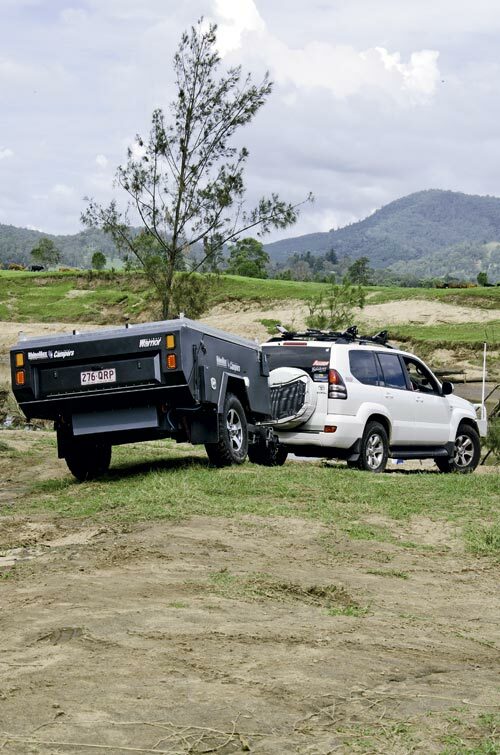 The camper weighs around a tonne, so ideally, a decent vehicle is in order for towing, especially offroad. I was looking forward to cracking a beer with Steve and Andy as their wives Judy and Jayne unfolded the camper, but it wasn’t to be. Instead, the chivalrous pair set about the task on the banks of the Mary River as their wives nursed glasses of wine and admired the countryside before adding the finishing touches to our set up. 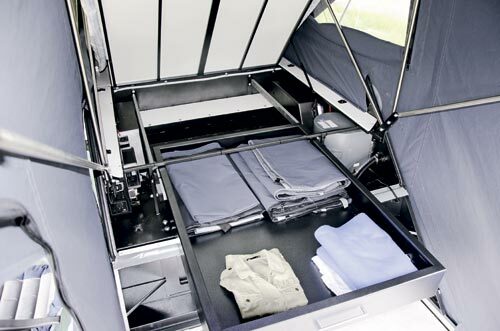 Like most fold-out campers it was easy, with the rigid top folding out on gas struts and serving as the floor base to the sleeping quarters. The awning took longer, which again is typical. The stainless steel kitchen is all-inclusive and budding Master Chef or MKR potentials will appreciate the Thetford three-burner stove with sink linked to the Truma gas hot water system. 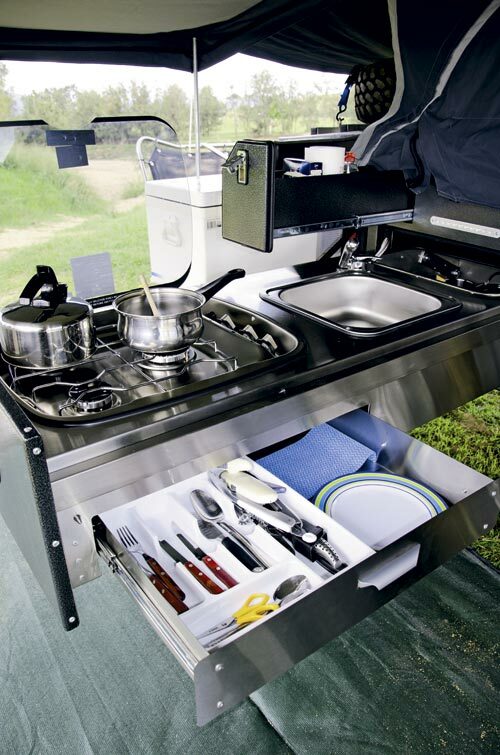 Cutlery has a dedicated drawer below and there’s pantry storage up against the trailer side. The assembly slides smoothly on rails out to the side under the awning; it’s a pleasant, social arrangement close to the main entertaining area ensuring the cook stays part of the action. In front of the kitchen, towards the drawbar is space for a fridge/freezer. 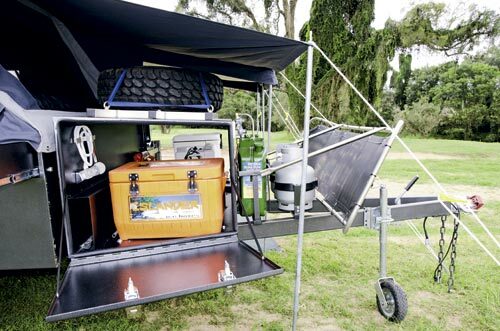 The review camper was supplied with a small 38L fridge and eski, but there’s enough room for a large 80L portable unit. I like the fact it’s accessible from both sides of the trailer. 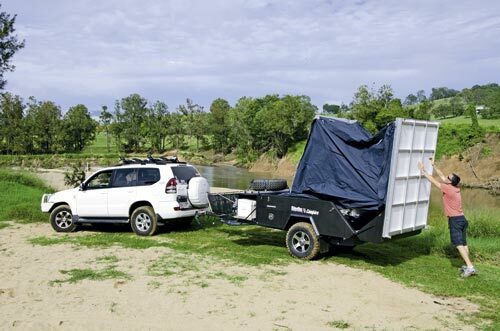 The Outback Warrior RX opens out to the rear of the trailer, providing a decent size awning from the kitchen area right back to the tent section. 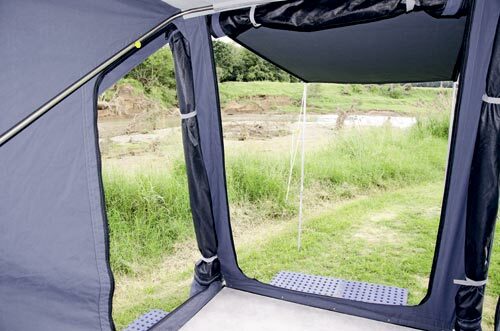 Internal access on both sides allows for a private, portable shower set-up, available as an option. When it comes time to lay down your head, the queen size innerspring mattress will have you sleeping like a baby. Access is via a small step or lip below the clothes drawer which works, but a small ladder will suit those less supple. 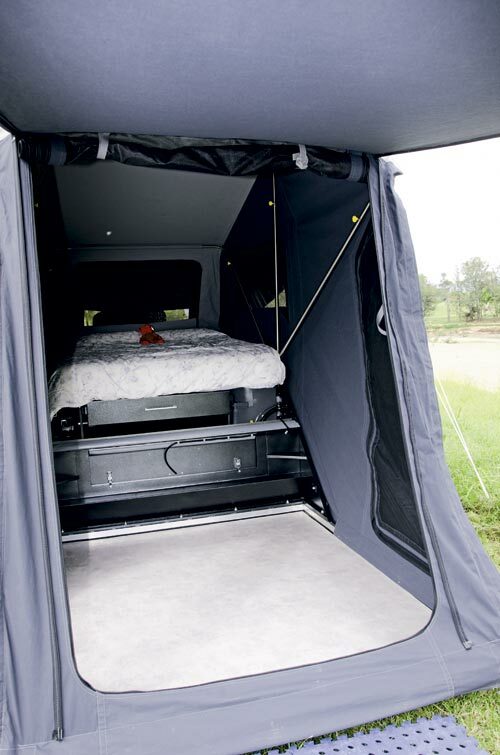 The berth lifts on gas struts revealing a secret storage area below, even when the bed is made. This compartment stores the comprehensive electrics panel, which is also accessible via a locker door so you don’t have to lift the bed. You can maintain the gas hot water system from here as well. 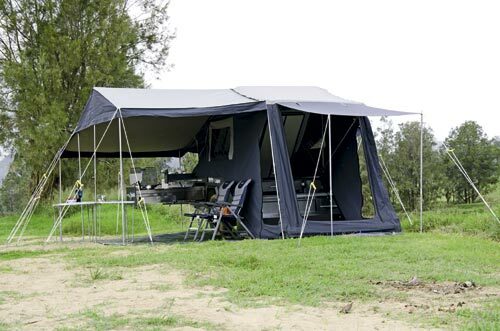 Overall, it’s simple and spacious in the tent section. 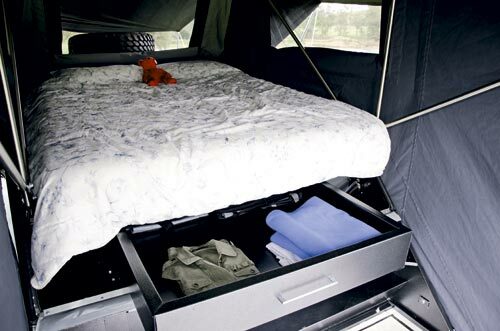 For couples its ideal but families can still fit a camp cot, bunks or a single mattress with room to spare. Children’s rooms, annexe walls and shower and toilet rooms can be added down the line. 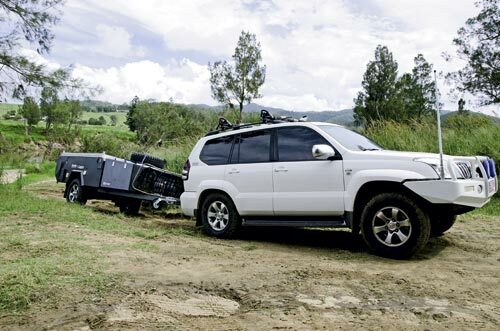 There is always more to a camper trailer of this calibre than words can adequately describe. 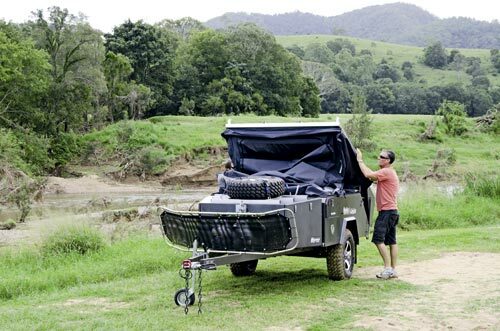 The Hammertone powder-coat finish, the aluminium frame under the floor which doubles as a roof rack, the extra-long drawbar with room for jerry cans and gas upfront: the list goes on and on. 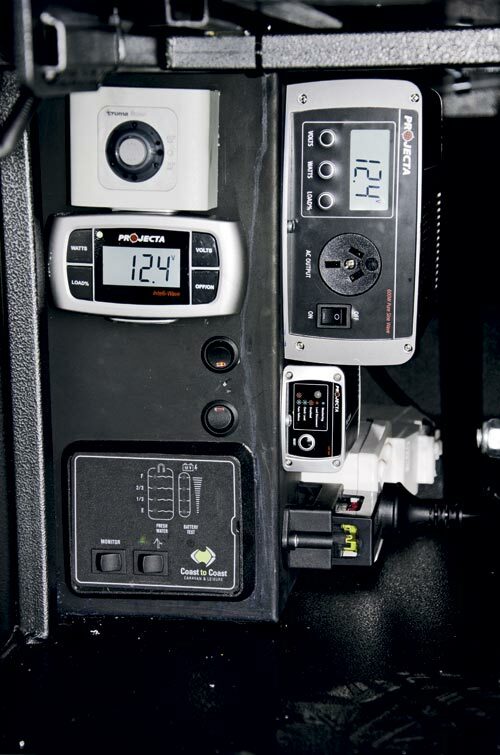 The Warrior RX’s complete electrics include twin 100Ah Bosch deep-cycle Leisure batteries, a 110L water tank, battery and water tanks level and condition monitor, 60W pure sine wave inverter, 240V charge system and LED lighting sustaining you for days off the grid in comfort and style. The quality of the build stands out and the internal and external components suit offroad. Perhaps best of all, these guys are great to deal with and will customise within reason to suit. Approximately two hours’ north of Brisbane in the Mary Valley is the Kenilworth Homestead which dates to the early 1860s. The privately-run outdoor recreation and function centre east of Kenilworth rests on the Mary River. There are no designated sites, just turn up and find a piece of grass or sand for to set up your camper and relax — there is plenty of space. Kenilworth has plenty on offer from horse riding to scenic hikes, an awesome river for kayaking or fishing, and a few 4WD tracks, which unfortunately we didn’t get a chance to try out. Visit www.kenilworthhomestead.com.au for more information. Originally published in Camper Trailer Australia #65, May 2013. 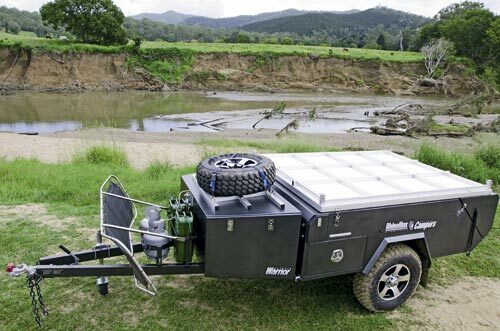 Find Rhinomax campers for sale. Search for new Rhinomax campers.